How to Optimize the Energy Efficiency of Cooling Towers | Manufacturers of Cooling Towers & Systems | Delta Cooling Towers, Inc. When evaluating the success of any piece of industrial equipment, the main thing many people consider is the equipment's price-performance ratio -- how much it costs to operate the equipment weighed against with its ability to do its job, or simply called efficiency. For cooling towers, mechanical equipment that cools water produced by industrial processes like chemical processing and food processing, this is especially true. 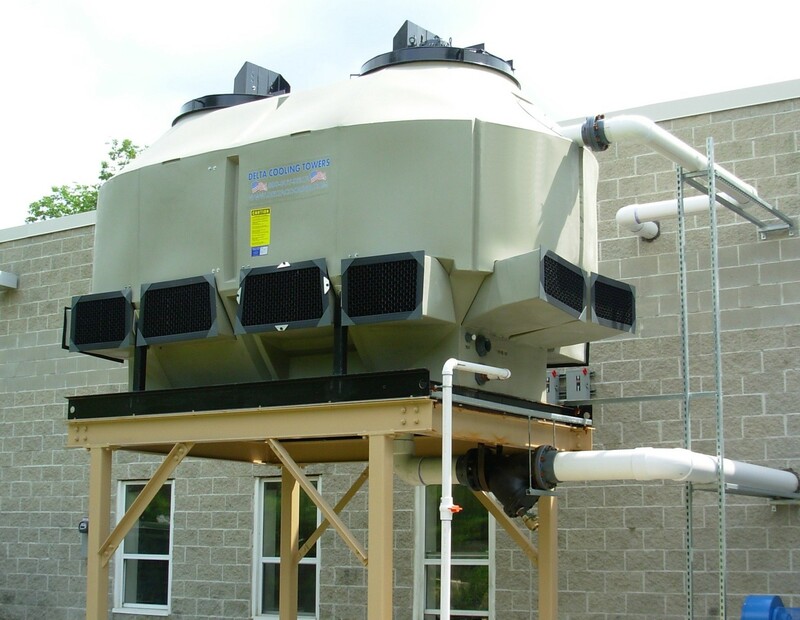 A cooling tower system can be one of the biggest energy consumers within a facility. As a result, many industrial plants strive to make their cooling towers cool the most water through evaporative processes while using the least amount of energy. When water is evaporated through a cooling tower, it leaves behind a number of dissolved solids, including calcium, magnesium, chloride and silica. Over time, these dissolved solids increase in concentration, and if they aren't properly filtered, they will eventually begin to wear down the cooling towers' process equipment and reduce the efficiency of your cooling tower performance. To combat this, along with hiring a competent water treatment company, consider a filtration system like a side stream sand filter, which are a least-costly option. Evaluate the energy use of the cooling tower, this is mainly the fan and pump horsepower (HP). Ensure the cooling tower meets ASHRAE 90.1 standards with regard to HP per cooling ton at a minimum. If there is available area, there will be even lower HP cooling tower options that enable a great amount of energy savings year after year. Since cooling towers are designed to meet cold water requirements on the hottest, most humid days, most days a cooling tower only needs a fraction of the horsepower available. To take advantage of this install a VFD that reduces the fan energy used tied to a set cold water temperature that optimizes the process. Have any other questions, comments or ideas for us on improving cooling tower performance? Get in touch and let us know!